My nation column, “Israel Celebrates a Return to the Status Quo in the Middle East,” is here. I went to the Rock n Roll Hall of Fame ceremony at the Barclay’s Center, but I’m in Spain on vacation with my family, and it’s Passover so you can read about that here. I have nothing to add that would not be mean. Sorry. Oh, and regarding the Pulitzers, I strongly agree with the choice of The Goldfinch. It’s my favorite novel since Jonathan Franzen’s Freedom. Give it a try if you have not already. Notably, right after my story came out, AJAM announced its first layoffs, of a few dozen staffers. While no doubt embarrassing for a network still trying to reach escape velocity, these growing pains aren’t necessarily a bad thing in the long-term. In reporting the story, it was mind-boggling the amount of resources—both full-time staff and freelancers—the network had brought on board for the launch. Ridding itself of some of that temporary, start-up baggage was probably inevitable and wise. So too was the network’s decision to dump its inexplicable devotion to what amounted to token sports coverage, something I noticed (and called out) in my blog post last fall. Not so encouraging, however, was AJAM’s choice to scale back of its social media-focused half-hour talk show, The Stream, from six times a week to once. Having spent an afternoon watching that show behind the scenes, it seemed to offer a glimpse into a more engaged, democratized future of news discussion, thanks to its hearty use of the show’s hashtag and a second-screen app that deeply integrated viewer Tweets and user-made thirty-second videos into each TV broadcast. Then again, such a web-focused show was perhaps ahead of its time. Though an Al Jazeera English version of The Stream—with different content—is broadcast around the world via the web, AJAM’s edition was blocked by the network to abide by the current licensing rules of US cable providers. Or as the show’s own producers lamented to me, the irony of their situation was not at all lost on them: here in America, The Stream actually doesn’t stream. Paradoxes like these were the most surprising and tragic elements of the story to me. And while I’m both hopeful for and skeptical of AJAM’s long-term prospects for success, the biggest takeaway in reporting this piece was how inherently problematic and counterproductive the cable TV market can be as a conduit for cable TV news. For example, after the network stubbornly refused to pay for cable carriage for months, AJAM CEO Ehab Al Shihabi acknowledged to me that the network’s recent distribution deal with Time Warner did involve “an incentive plan” (which he nonetheless insisted should not be considered “pay”). But it’s telling that AJAM was willing to bend this far to get onto a cable provider that, while the second-largest in the country, had still lost subscribers for eighteen consecutive quarters as of the start 2014. The proposed Time Warner merger with No. 1-ranked Comcast would no doubt only exacerbate this kind of inverted power dynamic and, as Senator Franken ably put it, be a “disaster” for American consumers. 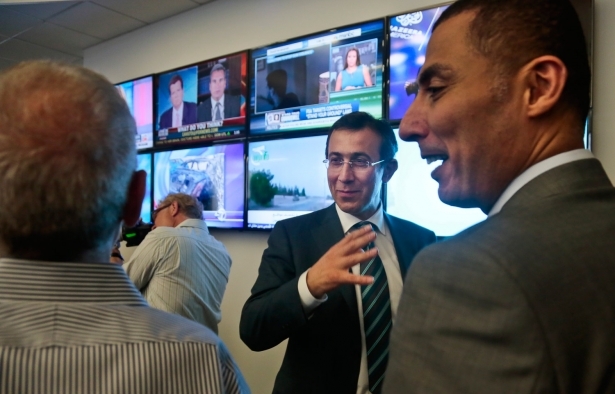 Given enough time, Al Jazeera America just may be good enough to save cable news, but by the time it does, cable TV itself may not be worth saving anymore. Reed: After the latest mass shooting on Sunday, this one at a Jewish Community Center in Overland Park, Kansas by an anti-Semitic, white supremacist, I felt compelled to re-post on Twitter an Altercation column on gun control I wrote not long after the Newtown massacre. It looked at what real gun reform would look like and cost here in the US if we, as a nation, finally decided to confront this self-inflicted health crisis. It prompted this response that I thought worth sharing. Good article contrasting the different responses towards gun reform between Australia and the US. Here in Australia there were actually many other massacres prior to Port Arthur. Two occurred here in Melbourne, while another occurred in Sydney. All of these occurred within a ten-year period. In most every occurrence, Port Arthur included, they were committed by young males with mental health issues with the ability to gain easy access to firearms. I’m sure the desire to commit these atrocities is there with some young troubled males, however, they are no longer able to gain access to these weapons and therefore the threat has been largely removed. That’s not to say it won’t occur again, but thankfully it has been almost twenty years since Port Arthur. It seems that virtually every unfortunate massacre that occurred in the US has been committed by a young troubled male as well so to me that has to be the priority to make it much harder to gain access. It intrigues me this argument that the criminal element will always have access to these weapons, yes they will, but it is not criminals going around causing massacres, it is troubled young males. I do hope one day the power of the NRA is reduced and sensible gun reform is passed. As a father of a young daughter I’m glad to be in a country where she can happily go to school and we don’t have to be even remotely worried about anything untoward happening. I sincerely hope that can be the reality over there one day as well.